Here's a boy who leaves his remote mountain village and goes off in search of adventure in the world outside. But he has a lot to learn. But Yoss thinks that not even the Speaker really understands what that means. Perhaps the Speaker has never been to a town himself. Hardly has Yoss set out on his road than he is stopped by two ruffians who steal from him and then keep him in their company. You could just shrug and say that the boy has fallen in with a bad lot, but we know Yoss a bit better than that. He really does not know enough about human nature to be able to distinguish the good from the bad. His mind teemed with rage. He jabbed at himself again and again with a finger of blame and accusation. How could he not have known what Conrad and Gaspar were doing? He must have known. It was a robbery, of course he had known. Who but a thief holds a knife to another man's throat? And if he didn't know, it was only because he had chosen to pretend. He had willingly believed Conrad's lie, and surely that was more contemptible than facing up to the truth. Not only was he a robber, but a coward! Not only a coward, but a fool! How they must have laughed at him, the boy who didn't even know when he had just robbed someone. 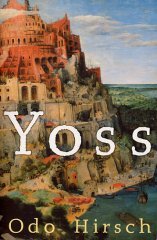 But Yoss was new to the town through which he now walked, and of the many lessons that it would teach him, he had learnt barely the first. Money isn't the only thing men covet. Just because one has no possessions, it doesn't mean he has nothing that others will want to steal. Before Yoss sees with the eyes of a man he will have been a robber and a slave and a beggar - and he will meet just a very few people along the way who will help him. And when he returns to his village in the mountains, Yoss thinks he has brought nothing back to show for his adventures. But he is wrong. He has brought with him a knowledge of human frailty, which serves him well for the rest of his life! A dark and brooding story, but I think it will sweep you away. Highly recommended! Odo Hirsch has written many brilliant books for younger readers, but this is his first for young adults.